My obsession with Canis lupus began when I was five years old. A local wildlife refuge brought a grey wolf to the Charleston museum in Charleston, SC as a form of educational outreach, and my mother — who jumped at any chance to expose her children to nature – packed my sister and me into the car. I was not afraid, as children often are when they think of wolves. My mother, a staunch wildlife advocate, counteracted every public-school reading of “Little Red Riding Hood” or trip to see “Peter and the Wolf” with firm reminders that “no healthy wolf has ever killed a human in the United States.” These animals, she assured us, were grossly misunderstood. So when we entered the museum, I felt a rush of excitement rather than fear. Never in my life had I beheld a more magnificent creature. He lay sprawled on one side at the feet of his watchful trainer, huge paws stretched languidly in front of him, seemingly at ease. Only the intensity of his amber gaze gave away his wildness. In a fit of enthusiasm, my sister and I fell to our knees in front of the animal and buried our faces in his well-brushed coat, much to the astonishment of the trainer. I ran my hands through the thick fur and marveled at the colors; what appeared grey at a distance was actually a subtle blending of reds, browns, blacks and whites, weaving together in a kind of natural tapestry. I was enthralled; the love affair had begun. This was 1996, in the middle of a critical time for grey wolves in the United States. Listed on the endangered species list since 1974, the wolves were subject to a series of recently implemented recovery plans. Biologists were in the early stages of reintroducing wolves to Yellowstone National Park, and several Midwestern states, including Minnesota, Michigan and Wisconsin, were developing management plans and conducting population counts. In Wisconsin, there were fewer than 100 wolves in the entire state. Eighteen years later, wolves face a dramatically different landscape. There are now more than 800 wolves in Wisconsin, 2,200 in Minnesota, and as many as 10,000 or more in Alaska. Yellowstone is thriving with its keystone species back in place. Conditions seem so favorable, in fact, that the U.S. Fish and Wildlife Service proposed on June 13, 2013 that the grey wolf be removed from the endangered and threatened species list. Delisting is typically considered when an endangered species meets its recovery plan’s goals. When this happens, the Fish and Wildlife Service conducts a study of any factors that could still threaten the species’ survival, such as disease, overhunting or competition with other organisms. If the researchers conclude such risks are not substantial, the Fish and Wildlife Service writes an official delisting proposal explaining the research that went into its decision; the proposal is then reviewed by an independent panel, and the decision is opened up to public comment. The complete process is often an emotional and highly politicized affair. The wolf proposal, which claims that population numbers are stable and unlikely to suffer from any external threats, recently underwent its own review, conducted by a panel of scientists from unaffiliated institutes. The results sparked controversy across the nation when the panelists concluded that the Fish and Wildlife Service’s research is “not the best available science.” Touting the panelists’ claims of flawed assumptions and poor data analysis, opposition to the proposal — particularly among conservation groups, such as Defenders of Wildlife and the Center for Biological Diversity — is strong. The Fish and Wildlife Service is still deliberating, but it expects to announce its final decision by the end of the year. The gray wolf is no stranger to politics. In the decades since it first came to the spotlight, the species has been the subject of more debate, research and legislation than most other animals combined. I should know; I have marked the passage of time by victories and defeats in wolf conservation since the moment I set foot in that museum so many years ago. We have grown up together: the wolf struggling to resurrect its decimated populations, and I wending my way through grammar school, high school and finally college. It is a long and winding road we have traveled, the wolf and I. In 1997, I watched the Discovery Channel documentary “Wolves at our Door” with the same excitement most children my age felt when they watched “Beauty and the Beast.” While my eyes were glued to the television screen, Minnesota’s Department of Natural Resources was conducting a survey of wolf distribution and abundance in the state. It estimated just 112 wolves, broken up into 20 packs statewide. In 2000, I visited the red wolf sanctuary on Bull Island, SC. Red wolves are a different species entirely — Canis rufus rather than Canis lupus — but the similarities were enough to fascinate me. I read Gray Wolf, Red Wolf by Dorothy Hinshaw Patent to brush up on my wolf trivia. Meanwhile, Minnesota passed a bill outlining a new wolf management plan. The plan allowed livestock owners to shoot wolves that threatened their property, a provision that wolf conservationists found abhorrent. A collection of advocacy groups promptly filed a lawsuit. In 2001, my favorite book was “Julie’s Wolf Pack” by Jean Craighead George. Back in Minnesota, the lawsuit was dismissed. The bill went to the Fish and Wildlife Service for review. Over the next few years, the agency began stripping the wolf’s legal protections. In 2003, it reclassified the gray wolf into three separate populations: the Eastern Gray Wolf, the Western Gray Wolf and the Southwestern Gray Wolf. It then downgraded the Eastern and Western segments from “endangered” to “threatened.” The status change offered fewer protections for these populations and, in some cases, allowed hunters to kill wolves that threatened livestock. In 2005, my Christmas present was a CD recording of grey wolves howling, complete with music in the background. I kept it in the car so I could listen to it while driving around with my family. I thought no other sound in the world could be more captivating. The wolf, however, had bigger things to worry about; the Eastern Gray Wolf population was up for total delisting. While I rode around listening to those spine-tingling wails on repeat, the U.S. District Court in Oregon thwarted the Fish and Wildlife Service’s plans with a ruling that lambasted the “arbitrary and capricious” reclassification and listing changes from the past few years. Vermont quickly followed suit with a similar ruling. The Fish and Wildlife Service was forced to return the gray wolf to its pre-2003 legal status, undoing the reclassification and listing changes. In the ensuing years, the Fish and Wildlife Service attempted a few more reclassifications and delistings, but they were all overturned. I continued adding to my collection of wolf-themed objects — a calendar here and a poster there, a paperweight, a pair of earrings. In 2009, I wrote my college admissions essay on the topic of gray wolf conservation — the reason I had decided to study zoology. State-regulated wolf hunting seasons opened in Idaho and Montana that year. Over the next four years, the wolf and I experienced our fair share of trauma. I struggled with my labwork and despaired over my waning interest in research, while the federal government returned more and more control to the states, even going so far as to remove federal protection from wolves in the Western Great Lakes region, which includes Wisconsin, Minnesota and Illinois. State hunting seasons opened up around the Midwest. And finally, the Fish and Wildlife Service released last 2013’s total delisting proposal — the culmination of the wolf’s troubled history. 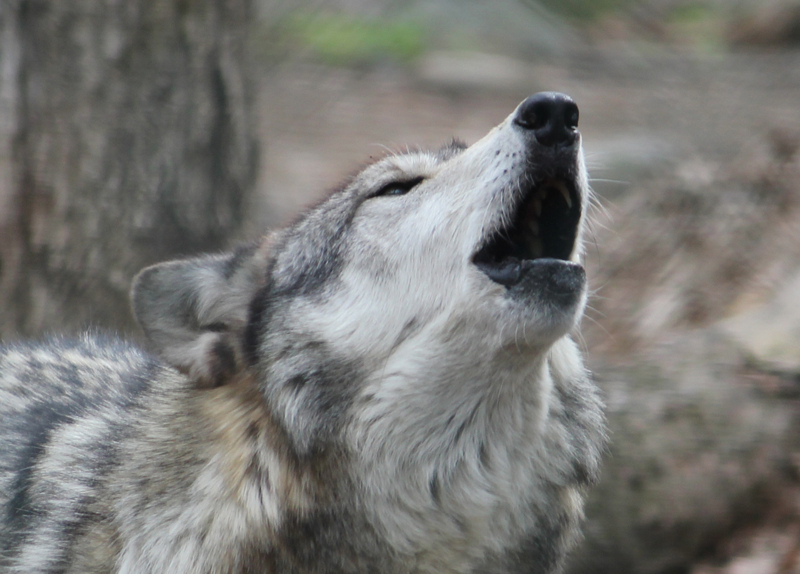 The independent review panelists explained that the proposal relies heavily on one gravely flawed study, which they claim includes poorly supported classifications of wolf subspecies and inaccurate statements about the gray wolf’s historical habitat range. Some panelists suggested that the researchers discounted or ignored certain data that might have undermined the proposal. In addition to the bad science, some biologists argue that wolves do not occupy a significant enough percentage of their historical range to be delisted. Wolf-lovers nationwide are decrying the proposal with clenched fists and gritted teeth. Still, while the final decision is not yet made, we must acknowledge that a turning point may have come in wolf history. It is the end of an era in more ways than one. At the same time the proposal was being drafted, I was in the process of abandoning my zoology degree and my dreams of conservation research, quitting the biology sphere forever to pursue a career as a writer. I did not make the choice lightly. After so many years of planning for one career, my decision to switch paths was fueled by months of research and soul-searching — time enough to convince me, and all those connected to me, that this was the right path. And so it should be with the wolves. Their struggle has spanned decades of political bickering and legislative seesawing. Their populations have been subject to countless experiments with captive breeding, reintroduction, rezoning and controversial management. They have teetered on the brink of irrevocable extinction and have passed nearly a half-century soldiering their way back. Any decision regarding their future should satisfy not only the federal government, but all those connected to the wolves — the environmental agencies, the wildlife advocates, the bright-faced children sitting at home reading their books on Canis lupus and dreaming of the future. The experts and the advocates are not convinced. I am not convinced. The time is not right to pull the plug on this species. That day will come, one day — of this I have no doubt — but until the evidence is sufficient, we must stand with the pack and march on. Chelsea Harvey is a recent graduate of Auburn University, where she received a B.S. in zoology, as well as minors in English and Spanish. Unable to choose between her love of science and her love of writing, she spent most of her free time as an undergrad working for her campus newspaper while simultaneously memorizing hundreds of scientific names for class. Outside of SHERP, her interests include playing music with friends, traveling and keeping up with international affairs. Here! Here!! I totally agree!! Well-said and more people need to understand the importance of the wolf. Thank you!!!! It is bizarre, once again, to find that human beings find themselves judge and jury on the survival, or not, of another species. Where do we find we have the right of such a judgement? Why do we feel it is necessary to ‘manage’ any native population, except those under threat from invasive species? And in those terms, humans are the invasive species. Will those who support wolf-hunting and ‘control’ legislation mourn the day the last wolf is killed? I hope so, because that will be the day they sign their own warrant of eventual distinction. I raised some gray wolfs back in the 80’s and 90’s,, i had one gray wolf that lived to be 17 years old . he was the best animal i ever had if people knew wolfs like i do and lots of others that know wolfs, people might have a different look on then.. wolfs have more compassion, more love then people are aware of.. they are the most protective of family and friends. there was one time that i was walking Kodi, my wolf, and i never had to put a leash on him. we where walking down the side walk and there was some kids playing in a field. all of a sudden this German Sheppard cam around the back side of the field and went after one of the little girls. i saw the dog coming t words the girl and the next thing i knew the dog jump at the girl and knocked her down. and then started to go after her again. i was about 20 feet from them and kodi was right next to me, i said kodi get him,, kodi ran to the Sheppard and pulled him off the little girl and then got between the girl and the other dog. kodi kept that dog from moiling those kids and then ran the dog off.. the girl was ok didnt have any cuts or anything she was just scared to death.. I held her in my arms for about 5 minets . then kodi came back and the little girl ran over to him and rapped her arms around kodi’s neck… kodi started licking her like to make sure she was ok… that girl might have bin afraid of dogs the rest of her life or may have bin killed ,,, when i told her that kodi was a wolf, she said i wont a wolf. i took her home to her mother and kodi walked on her side with her hand on his neck the hole way.. when her mother found out what happened she was so surprised that a wolf saved her Daughter. she told me that her feelings had changed about wolfs,, she said i always thought that wolfs where mean.. well after that she invited me and kodi over for dinner several times.. and kodi and the girl would play out back the hole time.. I moved from Colorado about a year after that. it makes me feel good that Kodi was able to change someones pinion about wolfs, i wish everyone knew that .. thank you for what you so for the wolfs….. I stand in agreement. This piece is well written and brings to the discussion those points which should not be ignored by the government. I believe that we are not yet close to complete recovery, a fact supported by scientific data. Yet, our elected officials and their appointed decision makers continue to ignore this data again and again. Sadly, many people do not really care about wildlife, wolves especially, and elect to believe the myths, the fairy tales, and the folklore which has branded the wolf, wrongly, as a vicious killer of all that we hold dear. Perhaps it is simply a case of “out of sight, out of mind.” I pray that some strong, confident, well informed leader will step forward and meet this issue with the passion it deserves. There are millions of us who support wolf recovery and who value their place in the wilderness. Why are we being ignored? Yes, I agree…let’s give these magnificent creatures the lives they were meant to have as they have already done. I for one…who have lived beside them on my farm for 15 years now…I have gained more respect, knowledge and compassion from these animals. My alpha male, an arctic wolf, only trusted me. He taught me more about life, as I watched the pack day in and day out. I can say I was part of the pack and this has been an awakening of the true meaning of life. They deserve their place in this world. I agree that wolves need to be protected more by our political leaders. It’s not fair for the species to be hunted and killed in such large numbers. They deserve protections and that starts with laws made by our political leaders in each state. Since each state owns all of the property inside of it, wolves are apart of that property. Each state has different laws and regulations regarding the hunting of the animal, however, we need to come up with a national law regarding the protection of the animal. What this animal needs is stability, and because of humans, this animal hasn’t had stability in North America for quite a while.